A good watch won't just keep you from being late to your next appointment. It'll help you stay alive. Which is why I've made this blog post. Watches tend to get neglected by other preppers, but I think you should know how they can benefit you in a survival situation. So, I've sought out the 9 best EDC watches for survival, and I've created comprehensive reviews for each of them. The next section is dedicated to telling you why they matter, though. So, you should probably read that first. Watches aren't typically what you'll find on a top ten prepping item list, but they deserve to be there. We all know that watches can tell time. What about their other functions, though? A good EDC watch can have several features that make it easier for you to survive in a survival situation. Things like altimeters, compasses, geo-mapping, flashlights, and other features can allow you to cut down on the amount of kit that you carry into the woods. Your watch is always on you, too. So, if you didn't have enough time to prepare for a situation, you still have a lot of equipment dangling from your wrist. In the following sections, I'll explain what the most important features are, and I'll spend a little time explaining why they're important. Your EDC watch needs to be accurate. If your watch can't tell time accurately, then you certainly don't want to pay attention to its compass or geo-tracking features. When you're looking at EDC watches, you need to know that the movement system or processor is made to high-quality standards. That'll make its main function as a time piece a lot more reliable. You'll be able to trust its other features, too. Good movement systems to look for are Japanese quartz and Swiss quartz. When it comes to processors, you can usually only trust the best brands. Don't buy a cheap watch if it uses a processor. Using a compass is one of the most basic ways to navigate, and it's simple to do. I personally prefer physical compass because they aren't as susceptible to being damaged, but a good digital compass will work just as well. When you're buying an EDC watch, make sure that the compass on the watch is capable of pointing north accurately. You don't want your most reliable navigation tool to send you fifty miles in the wrong direction. Using a compass is simple, but I suggest that you take some time to learn how before you start relying on one. If you need help, you can read this helpful article. An altimeter is another basic navigation tool. It measures how much you've ascended, and it can help you reach your destination when you're traveling in mountainous regions. These are a little more complicated to use. Most people aren't hiking up mountains and cliffs everyday. However, you need to take the time to learn how to u​​se an altimeter. I suggest buying a watch that allows you to set a destination altitude with its altimeter. You won't want to have to keep tabs on your altimeter when you're starving. A destination marker will make an alarm go off when you reach the altitude you set. So, you can set it and forget it. If surviving in a harsh environment isn't hard enough for you, mother nature will make it harder. Thunderstorms, blizzards, and other adverse weather conditions can be deadly in a survival situation. Luckily, some watches will use a built-in barometer to measure the air pressure in your area. When the watch detects an unusual fluctuation in air pressure, it'll sound the alarm. This in turn, gives you enough time to get to safety, and it'll keep you out of the worst of storms. It's a feature that can be handy during everyday life, too. You won't have to rely on inaccurate weather forecasts to stay safe. Geo-mapping is a feature that allows your watch to generate a GPS map of your immediate surroundings. That can make navigation a lot easier, and some geo-mapping features have breadcrumb trails you can activate. The breadcrumb trails can help you find your way back to another location. This feature may look as if it's a necessity, but you can achieve the same results with a compass, altimeter, and common sense. On top of that, geo-mapping is usually only available with smart watches. Carrying a smart watch is great for your everyday life, but they can die over a matter of hours. If you're going to go the smart watch route, I recommend bringing a back up watch with you. We just briefly talked about battery life, but I want to really explain how necessary it is. Your EDC watch is something that you carry everyday. So, it needs to be able to function as a normal tool. However, EDC watches are meant to provide support during an emergency, too. You don't get to choose how long an emergency lasts. A survival situation can last for five minutes, or you can be in one for three months. That's why you need a watch that will be able to last in any survival situation. I recommend solar powered watches because of how convenient they are. However, you can also get away with one that stretches a standard battery out for 6-12 months. You might get away with wearing a gold watch to the office, but that pretty watch won't last long in the wild. It's difficult to say just how durable a watch must be, but you need to make sure that your watch is at least able to get wet and be dropped without breaking. 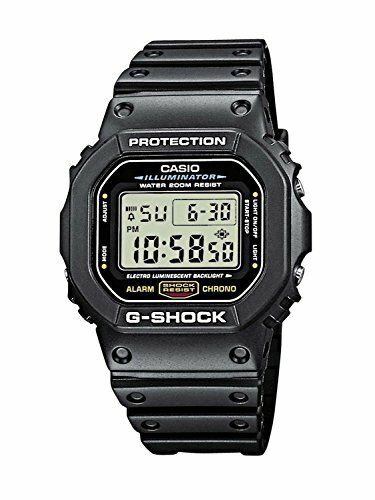 The Casio G-Shock line has been around since the 80's. It's reliable, and it's extremely popular with military members and first response teams. This particular model isn't expensive, and it's fairly durable. However, it does lack some of the goodies that I like to have in an EDC watch. The 1V is shockproof. You won't have to worry about it getting smashed to bits. It's also waterproof. You can't take it to the bottom of the ocean, but it'll survive if you fall in a lake. It uses Afterglow technology to illuminate its face. It's not as bright as a flashlight, but it's enough to make your life easier when things get rough. An automatic calendar will keep you aware of what day it is. So, you won't have to scratch a wall like Tom Hanks. I'm really disappointed in the lack of navigation features. It can handle its purpose as a watch well, but it's not going to help you get where you're going. This is a major drawback. However, it's one of the least expensive watches I'm reviewing. 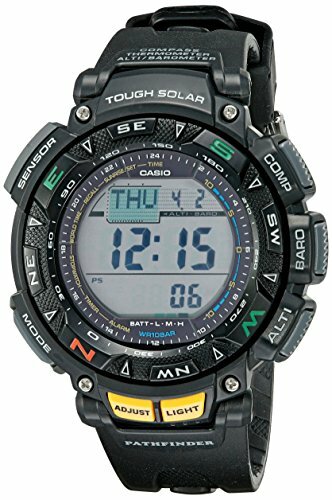 The portion of Casio's budget that went towards a calendar could have easily been spent on a good compass ring. Seriously, a calendar isn't a necessity. If I'm lost in the woods, I'm not worrying about what day it is. The Casio G-Shock was a decent watch, but it didn't have the features I like. 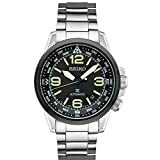 This Ezon watch is still affordable, and it has everything that's necessary in a survival watch. In fact, it's one the watches that I recommend the most. The Ezon has all of the navigation features that I require from an EDC watch, and it has some extra ones, too. 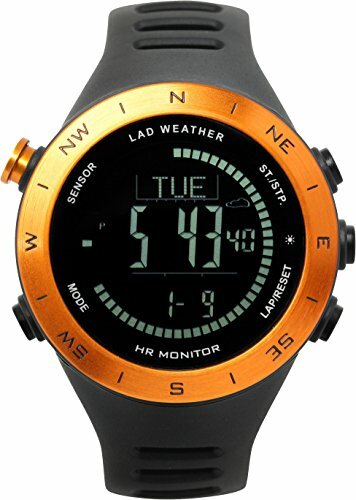 An altimeter, barometer and compass are all included. It also has a thermometer, weather alarm, and sunset indicator. Considering it costs less than $100, that's a lot of helpful features. The synthetic construction of the Ezon may look a little too aggressive for the office, but it's extremely durable. The strap is made from polyurethane, and the casing is a hard plastic shell. On top of having the necessary survival features, the Ezon is also outfitted with basic luxuries like a calendar and light. Those aren't absolutely necessary, but they're great for everyday life. The watch is built to make a standard watch battery last for an entire year. So, you won't have to worry about it dying when you need it most. All of the navigation features are digital. I'd prefer to have a physical compass ring, but the digital compass works just fine. A solar charging feature would have made the Ezon perfect. It would have dramatically increased the price, though. We've covered two options that aren't expensive. So, let's go over one of my favorite high-end watches. Garmin is known for their rugged smart watches. I know that I said a smart watch isn't a great option, but Garmin has put a lot of work into making the Instinct's battery last a while. When you combine that with the high-quality tools that it includes, the Instinct is very suitable for survival situations. The navigation tools are top-notch. The Instinct has a 3-axis compass for increased navigation abilities, and it has a barometer and altimeter. However, it also uses several different GPS networks to enhance each of those features. So, each one is better than what you'll find on the previous watches we reviewed. This thing was built to satisfy military standards. I don't even have to explain that in-depth. It isn't going to break unless you run it over with a tractor, or throw it in the ocean. The TracBack feature is a breadcrumb program. With it, you'll have no problem returning to camp. However, it'll drain the battery faster. Garmin has made sure that the Instinct is compatible with your smartphone and their app. That'll give you access to a lot of different fitness features. That's not something I look for in an EDC watch, but this is something you'll wear everyday. The added functionality is a nice bonus. The battery can last 16 days. That's enough battery life for it to work in a survival situation, but it's still a little too low for my liking. That's just a personal preference, though. The price isn't very appealing. It's worth the price, but I feel that most people will benefit more from a cheaper watch that just has the necessities. The Pathfinder is another watch in Casio's lineup. It covers all of the requirements that I outlined in the beginning of this post, but there is one major con that makes me want to suggest other watches. On its own, it's a great watch. It can help you navigate, it doesn't rely on a smartphone, and it can take a beating. However, I already covered a watch that does all of that for $50 less. If you don't want to trust your life to a relatively unknown company like Ezon, then this is the watch for you. However, I'd still recommend the Ezon first. Navigation tools were a major focus with this watch. You get your three main tools, but you also get a thermometer and light. Those aren't navigation tools, but they'll help you a lot while you're traveling. You can set it to operate with several different time formats. That's definitely not a necessity, but it's nice to have. The Pathfinder is made entirely from resin. Resin is almost as durable as steel, and it won't tarnish or rust. I don't like the price. The Ezon had all of the same main features, and it cost less. The extra features on the Pathfinder just aren't worth an extra bucks in my opinion. 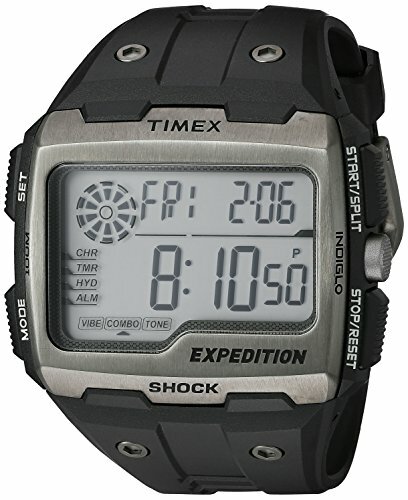 The Timex Expedition is an affordable watch, and it has one unique feature that I'm glad to see. However, it doesn't have all of the necessities. With it being a budget watch, I can overlook that. In this price range, I'd suggest that you look at the Casio G-Shock first, but this is a nice alternative. Hydration alarms aren't common. They're especially not common in this price range. However, they can help you remember to stay hydrated during the rigorous activity that you'll be doing during a survival situation. This is the one feature that makes me recommend this watch. The shockproof and waterproof features are pretty robust. You can easily snorkel with this thing, and you can drop it off of your house safely. It's impressively durable. Timex likes to use Indiglo. The Indiglo lighting technology is bright enough to function as a low-light flashlight, and it's more than enough for viewing the Expedition. The lack of navigation features is a major drawback. You can use primitive navigation techniques, and you should carry a real compass when you expect to go into the outdoors, but it's still a necessary feature that's missing. Paying this much for a watch without navigation features is almost a waste of money. It's great for exercising or daily use, but it won't do anything special in a survival situation. Seiko is one of my favorite watch companies. They put a lot of effort into ensuring that the construction of their watches is extraordinary. This Seiko watch isn't going to tell you when a tornado is going to hit, and it doesn't look like it belongs on Batman's wrist, but it's a high-quality watch. It keeps time with its Japanese quartz system, and it has one of my favorite features. It has a physical compass ring inside of the crystal. A physical compass ring will continue to work when the watch dies. So, you know that you'll always have navigation capabilities. It's a bit pricey, but it's the watch that I recommend the most. The Japanese quartz movement ensures that it is actually what time the watch says it is. A physical compass ring won't stop working when the battery dies. It may not be made from military-grade resin, but it is durable. The traditional materials will also look better when you're just going about your day. The compass is all that you really need, but an altimeter and barometer make life a lot easier. Sadly, this watch has neither of those. In the name of fairness, I have to criticize its lack of features. It's the most expensive watch on this list, and it lacks some functionality. However, it's expensive be it's a truly well-made watch. This is one of the few watches in the Ezon's price range that can actually beat it in terms of value. It's designed to keep track of all of your fitness stats, but it also has the 3 main functions that I look for in a watch. 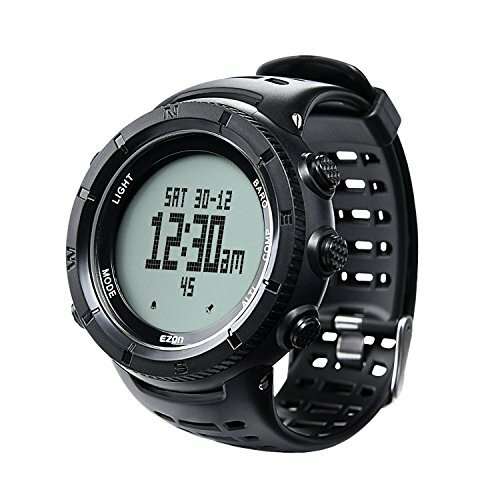 The amount of fitness features that the Trekking Watch has is ridiculous. I can't even fit them all in this short review. It can do just about anything you want it to. It tracks your heart rate, calories, steps, and it allows you to set goals for each of those. Beyond that, it also has navigation tools encase you end up lost. So, it's a great watch to wear during your normal life, but it can pull through when things get tough. The amount of fitness features is ridiculous. If you're into staying fit, you won't need any other tool to track your progress. The navigation tools are there to help you in a pinch. That makes this a very versatile watch. It's also very durable. Besides being shockproof and waterproof, it's made from a wear-resistant polymer. I feel as if the fitness features inflate the price a bit. Since they're not necessities, I have to consider that a drawback for most people. 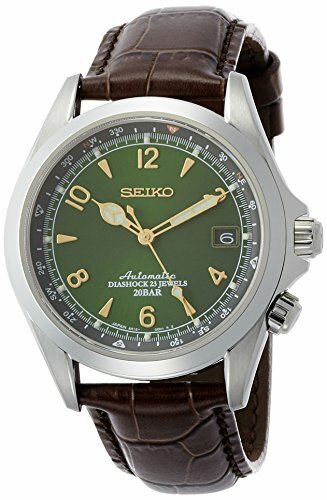 The last Seiko I reviewed was a bit too pricey for most people. This one is a lot more affordable. It's not cheap, but it does cost half as much as the last one, and it has the same features. Japanese quartz system powers the watch. It's also made from stainless steel. However, it has the same drawbacks. You won't get a lot of features with it, and it costs more than the other watches. It's a high-quality Seiko watch. Every feature that it has was crafted by experts. The physical compass ring is a surefire way to get where you want to go, and it doesn't require batteries. You won't look like G.I. Joe wearing this to an office party. That might sound silly, but you don't want to look like you're going off to war everyday. The last Seiko had a leather strap. The steel on this one is obviously more durable, but it's harder to replace, too. Besides a compass, it doesn't have any navigation features. At this price, you can find a more functional watch. It just won't be as great as the Seiko. While it's not my favorite, a lot of people swear by the Lunar Pilot. After all, it was the watch that helped land the Apollo 15 shuttle. It doesn't have any fancy navigation features, and it won't keep track of your heart rate, but it does have an extremely accurate quartz system, and it functions as a chronograph. So, it can take some punishment from the outdoors. The chronograph can be useful for timing things very precisely. That's why it was used on the Apollo 15 shuttle. The waterproof feature makes it just suitable enough to be on this list. You're likely to encounter some harsh weather, and you wouldn't want your watch getting destroyed by it. 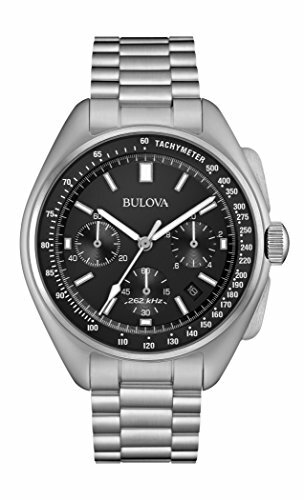 Bulova makes accurate watches. A watches main feature is its ability to tell the time. So, at least this one can do that perfectly. It's hard to recommend this to people because it doesn't have navigation features. However, it's great as a watch. You'll have to carry your own compass, though. With so many options being less expensive with more features, I can't say that this is one I'd recommend for most people. I'm sure someone will appreciate its rich history, though. The Ezon is the watch that I recommend the most. 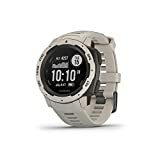 It's not as robust as the Garmin, but it has everything that you need to survive, and it will function well during daily use, too. 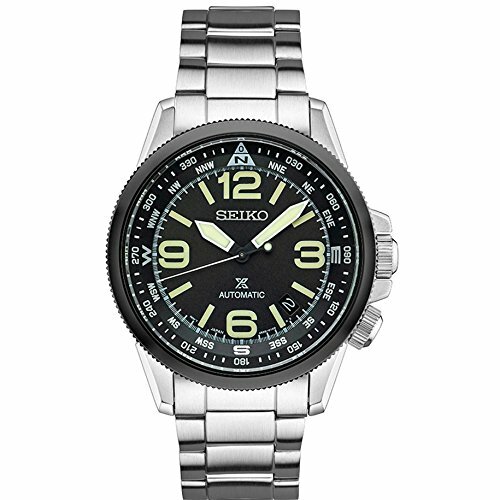 I personally prefer the leather-banded Seiko, but it doesn't have all of the functionality that the Ezon has, and it costs five times as much. If I take away my personal biases, I believe that the majority of people reading this will get the most bang for their buck from the Ezon. The other options are all great alternatives. As always, I want to thank you for spending your precious time reading my opinions, and I would love to hear what you think about these watches in the comments. If you have friends that might benefit from it, I suggest that you share the article with them.